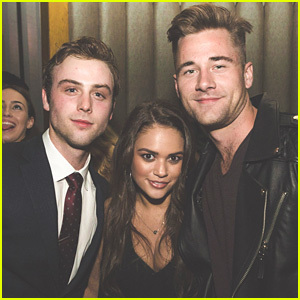 Chris Galya Photos, News, and Videos | Just Jared Jr.
Jack Griffo Celebrates His 20th Birthday With Ariel Winter, Ross Lynch, & More! It looks like Jack Griffo had quite the birthday celebrations this past weekend! The Thundermans star celebrated turning 20 years old with some of his best friends! Ross, Rocky, and Ryland Lynch were in attendance, as were Ariel Winter, Sterling Beaumon, Chris Galya, Barrett Carnahan, Eric Unger, Noah Centineo, and Paris Berelc. Thanks to everyone for all the bday wishes. It was a special one for sure!” Jack captioned one Instagram photo. What Do You Think Of Jack Griffo’s Beard? Take Our Poll! Ariel Winter keeps it comfy in her sweatpants on Sunday (November 27) in Studio City, Calif. The 18-year-old Modern Family actress gave her new boyfriend Levi Meaden a big kiss as they arrived at a friend’s house. The night before, Ariel shared a photo of her and her friend Chris Galya wearing matching outfits and captioned it “Always #twinning.” Check out that photo and another of their recent matching outfits below! If you don’t know who Levi is, check out these fast facts to get to know him a little. Garrett Clayton & Pierson Fode Go For a Swim at Just Jared's Summer Bash! Garrett Clayton lounges around in the pool while enjoying the beautiful weather at the 2016 Just Jared Summer Bash presented by Uno on Saturday (August 13) at a private residence in Beverly Hills, Calif. The 25-year-old Teen Beach Movie actor forgot to wear a swimsuit to the event, so he grabbed a pair of MeUndies underwear from the gifting table and jumped into the pool! Other stars seen taking a dip included Pierson Fode and Kendrick Sampson. 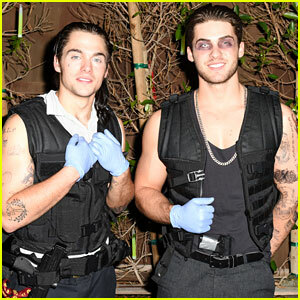 Also in attendance at the party were Isabelle Fuhrman, Teen Wolf‘s Cody Christian and Dylan Sprayberry, Spencer Sutherland, Chris Galya, and Shamari Maurice. FYI: Spencer is wearing Timberland shoes. Tyler Blackburn emerges from the ocean after taking a dip in the crystal clear water during his recent getaway to Great Exuma, Bahamas last week. The 29-year-old Pretty Little Liars star joined Jessie actor Chris Galya for the holiday vacation and visited Sandals Royal Bahamian in Nassau, Bahamas before heading to Sandals Emerald Bay in Great Exuma. “On island time thanks to @SandalsResorts,” Tyler shared on Twitter over the weekend before heading back to LA.